A couple of weeks ago I went to help at a Life Kitchen cooking class. 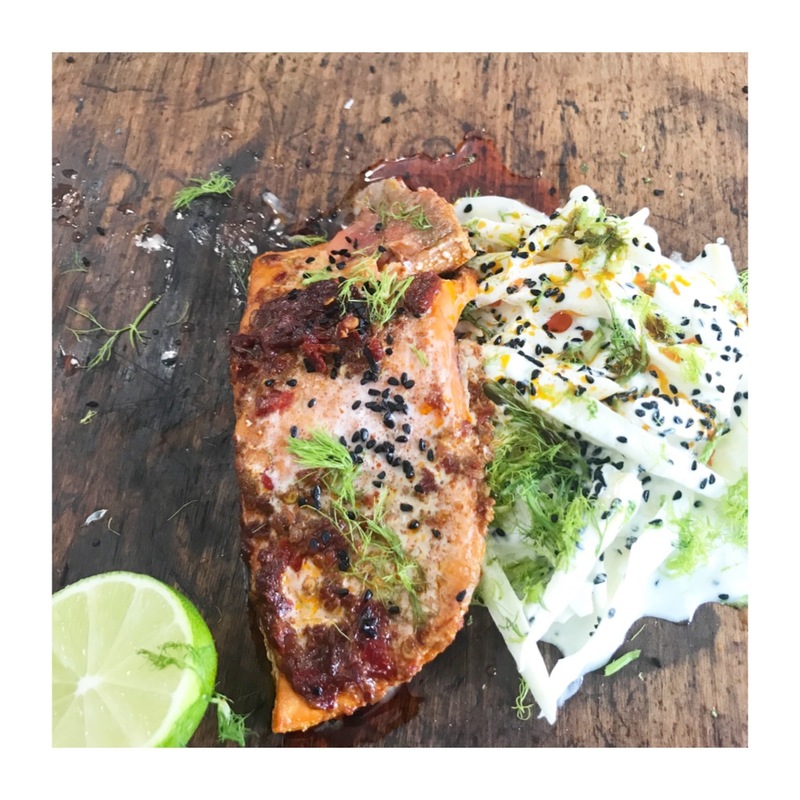 This Life Kitchen harissa salmon was one of the dishes that was part of the day and it was so good and easy that I bumped into most of the students in the supermarket over the road right afterwards as they rushed to buy the ingredients. I made it that night and twice again the following week. It is a brilliant mid week dinner. Before I share my take on it, please take a minute to read the powerful story behind this delicious recipe. 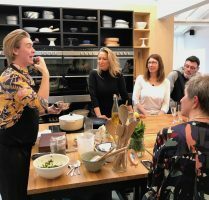 Life Kitchen is a project started by the brilliant Ryan Riley to help people living with cancer and undergoing treatment to enjoy cooking again. It provides free classes throughout the UK and has plans to do much more. It was so moving to hear so many of the guests talk about how their treatments had left them unable to enjoy the taste of food, taking away a simple joy from what was already a painful time. All the recipes in class have been developed with one of my favourite subjects in mind – how to max out flavour in food. Ryan showed everyone how adding umami and acidity amongst other things can stimulate appetite and start to help people enjoy food again. I don’t suppose any of us need a special reason to support a project like this. Like most of us cancer has affected too many of my loved ones and continues to do so. So I’m doing all I can to help Ryan and Life Kitchen raise the funds they need to make these brilliant free classes available to many more people living with cancer. 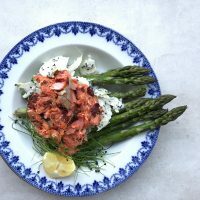 If you like this Life Kitchen harissa salmon recipe and fancy making it, please say thank you by donating whatever you can to the fundrasing campaign. Perhaps you could invite friends for dinner, make this and donate the money you would have spent on going out? If you have any connections that may be able to help through corporate donations or sponsorship, let me know. Watch the Life Kitchen video, learn more and donate here. Serve as it is or add these roast, squished potatoes, steamed asparagus or roasted cauliflower if you need more bulk. 1.Preheat the oven to 200°c (180°c fan) / 400°F (375°F convection). 2. Put the salmon fillets, skin side down in an oven proof dish. Spoon the harissa over the salmon and spread to coat it all over. 3. Place into the oven for 8 minutes. The salmon should still be a little pink in the middle when it is done. Remove from the oven and set aside. 4. While the salmon cooks, prep the fennel. Pull off any of the feathery green fronds and set them aside then cut the fennel in half, through the root. Cut each half by starting at the opposite end to the root with a large, sharp knife parallel to the root. Cut as thinly as you can. Then gather up the slices and cut through them in the opposite direction so you are left with small thin slices. Alternatively you can use a shredder on a food processor or the two horizontal lines on a box grater to get thin slices. 5. Add the fennel slices to a bowl with the yoghurt, the juice and zest from one of the lemons or limes and a pinch of salt. Toss together, taste and add more lemon or lime or salt as needed. 6. To serve, lift the salmon off the skin which will stay stuck to the pan. Serve the salmon alongside the fennel salad, scoop any harissa from the pan over the salmon and scatter the torn fennel fronds over. Sprinkle the nigella seeds over everything and serve with a wedge of lemon or lime. Leftover salmon and salad can be kept in the fridge and eaten within 2 days. It makes a great taco or sandwich filler for lunch the next day. You can now buy the equipment I use in this recipe (a Microplane zester and a juicer will really help) through my shop. I’ve spent years testing my favourite bits of equipment so rest-assured that whatever I recommend is the best tool for the job and will give you great results without cluttering your kitchen with unused tools. Find more recipes for harissa, salmon, fennel and mid week meals here.